Hello everyone! It's been way to long but I've been focussing on my exams recently and as I only have one more to go (French A2 paper next Friday, ahhhhh) I thought I'd take some time to write a post for ya'll! 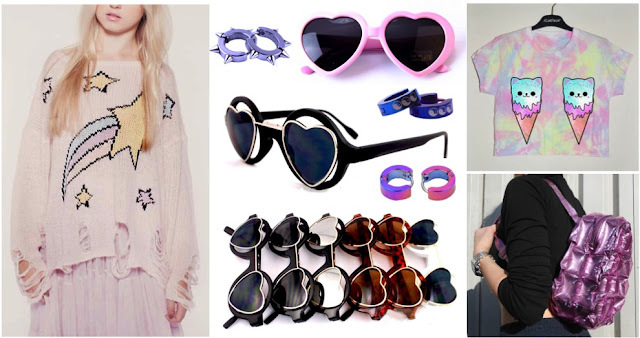 I've been accumulating items for a while now on my eBay watchlist and these are the pieces I'm lusting after most for Summer, my personal favourites are the kitty ice-cream crop top, as although it isn't the cheapest I love the design; the silver platforms and the Wildfox Couture dupe for only £8.99! It's pretty much exactly the same and would be so nice for cooler summer days, I'm in love with the colours and the rainbow/star design! Let me know what you think of these items! Love the shoes and the wildfox dupe jumper too! Can't go wrong with ebay! Amazing finds! I love the jumper and the shoes! Hi really nice pick x I want the wild fox jumper. aaah! That kitten icecream top is amazing!!!!!! You can also add some Indian dresses for girls, which will make you look gorgeous! Fabulous collection!! !...also love the trendy designer footwear!! I LOOOOOVE this top from Wildfox ! Did you received your order from Ebay yet ?? I really hope you'll share a picture of that sweater once you receive it :) I might order one for my self ! Great findings! I love to shop on ebay.